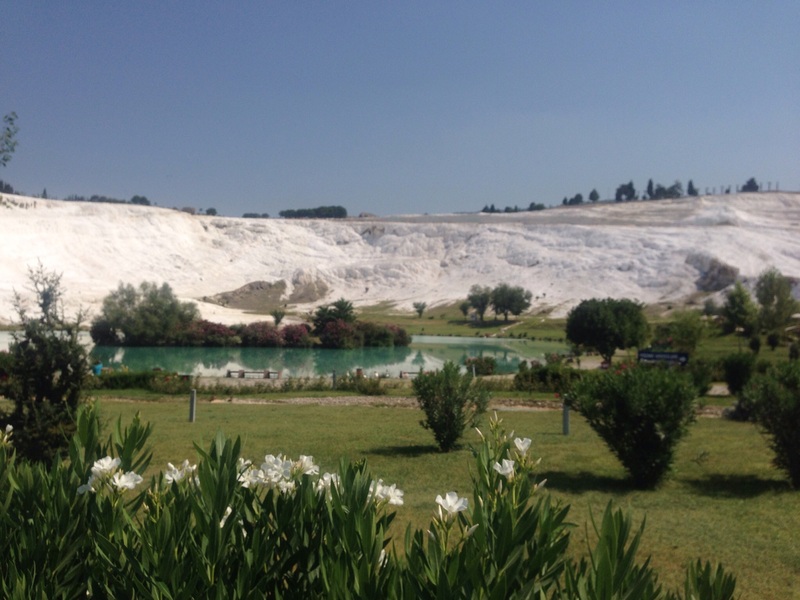 Huge sodium bicarbonate deposits at Pamukkale. The landscape started to change once again as the altitude rose to 1560m, the vegetation started to thin and the local villages were clearly poorer. Still the people remained and friendly as ever. David standing at alongside one of the massive fresh water lakes at Egirdir. 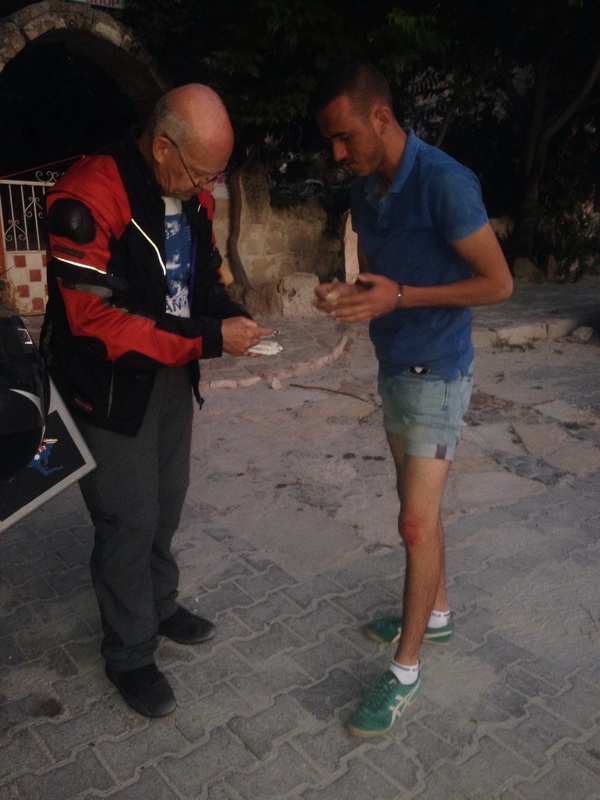 We arrived at Konya around 6.00pm and were sitting at a small eatery taking a well earned break and trying to plot our course to where the cheap hotels were located when we were approached by a couple who were riding a little Honda CB150. They had noticed us in the traffic and had taken the opportunity to say hello and when we explained what we were after, without hesitation they were soon escorting us to the hotels and made a couple of recommendations that worked a treat! With a couple of pictures taken and a friendly handshake they were off again. A wonderful gesture. One again the local people assisted us in finding accomodation. As it turned out, Konya is the most conservative Turkish city, so it made buying a beer a near impossible task, so we settled for a fruit nectar drink instead. Dinner consisted of the usual grilled meets and fresh salads….. yum! In the evening we wondered the streets and came across a bustling Bazaar with all the locals out shopping. We found this most odd as it was around 10.00pm and young kids and all families were out and trading goods from the latest platform women’s shoes to second hand fridges, you want it you can buy it at the Bazaar. Update on Steve’s bites from 4 days ago and they are still causing him itchy pain and redness. Obviously he seriously upset the wasp that bit him! 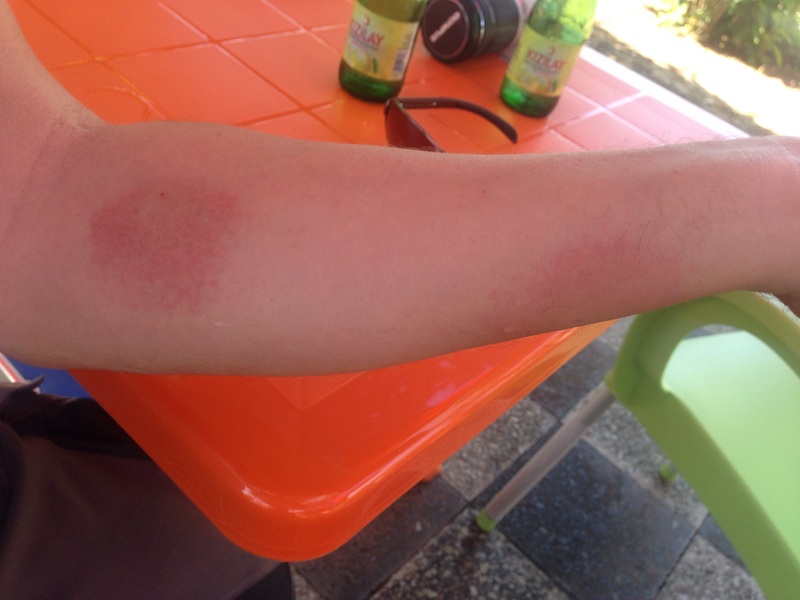 Four days after being bitten Steve still has redness. 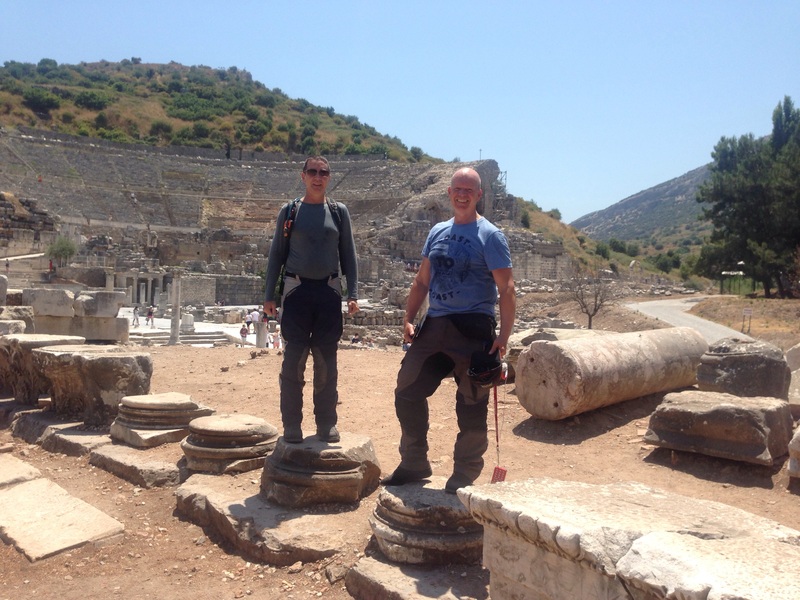 David & Steve by the coliseum ruins at Ephesus. 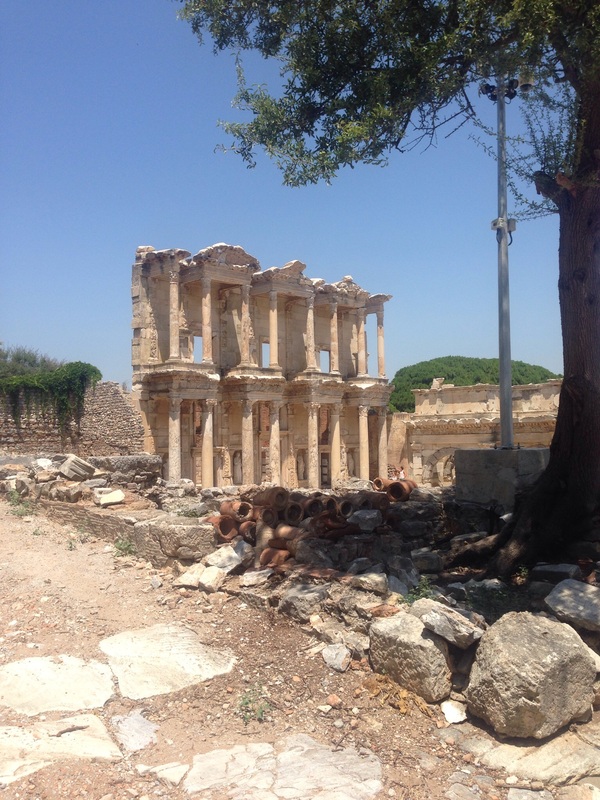 Today we visited the Ancient Greek and Roman ruins of Ephesus which has ruins dating back to the 10th century B.C. What we saw today was basically what the Romans had primarily built or modified to suit their needs at the time the city fell under Roman rule. The ruins are spread over a large area which involved a walk over 3km’s in 35deg C temps. Parts of the site (Temple of Artimes) is listed as one of the Seven Wonders of the Ancient World which gives you an idea of the significance of the ruins in this part of Turkey. Ruins of Ephesus dating back to 1,200B.C. We also visited a Government run business showing how the ancient skill of carpet weaving is done. It was extremely interesting and some of the rugs have up to 2,500 knots per square inch, which when you consider what that means when these skilled ladies are producing large scale rugs, it is an amazing achievement. You have to admire honesty in advertising! As with any major public attraction you also get the “side show” of the dodgy shops selling pretty much anything you require. 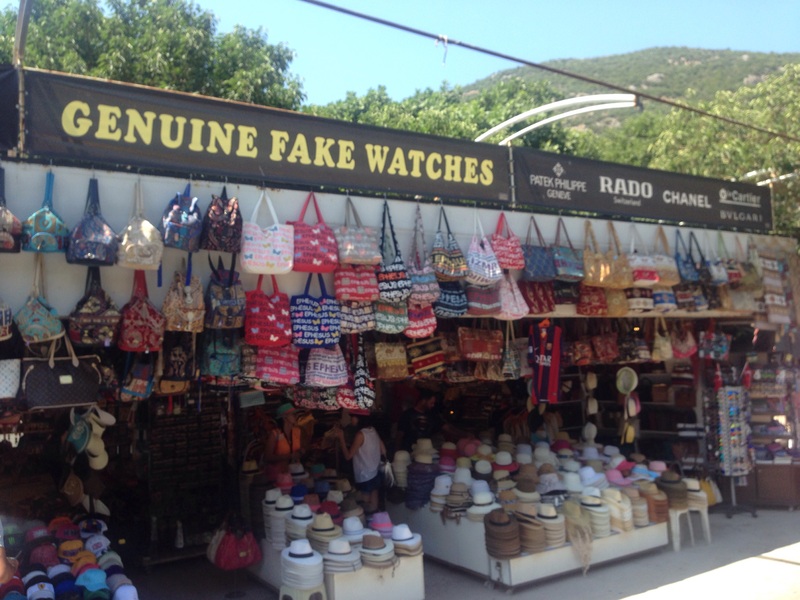 One particular shop was proud to be selling “genuine fake watches” which we both had a good laugh at. 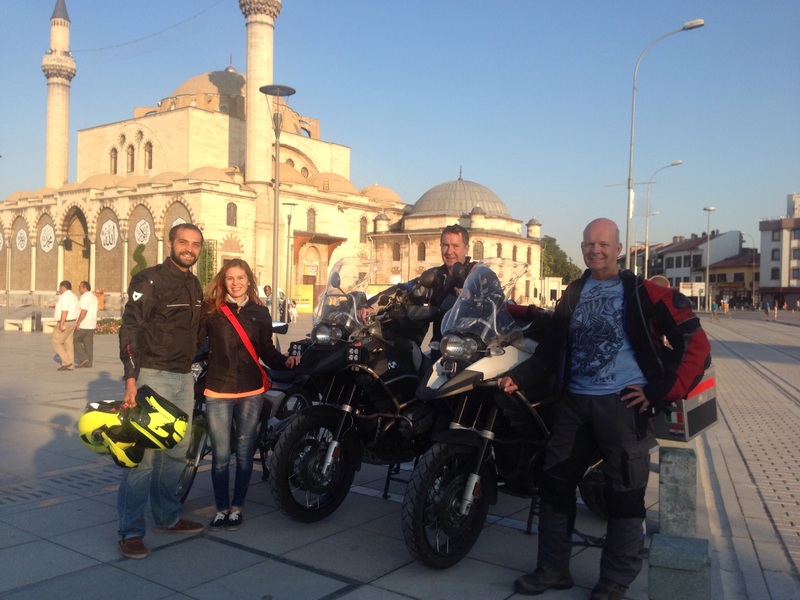 Once we had done the treck of Ephesus we were back on the road by lunch and off to Denizli for the night. The road trip today was only relatively short at 180km’s however the temps climbed to 40deg C for the first time today making the journey that much arduous. These temps are something will shall have to get used to as we head into the East. 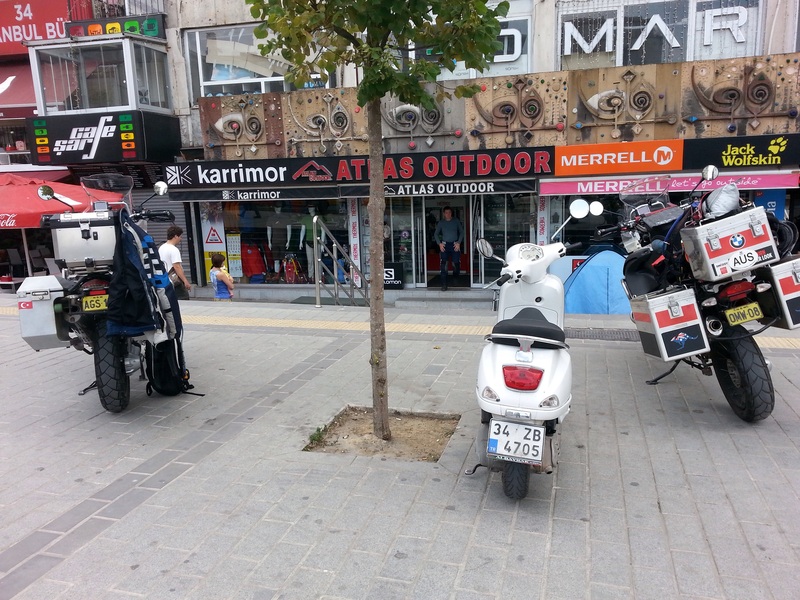 The conditions of these roads also takes getting used to, with oily patches not uncommon to glassy surfaces in cities where the bikes happily slide at a moments notice. Thankfully we both have ABS brakes which will assist should we have any panic moments trying to pull the bikes up. 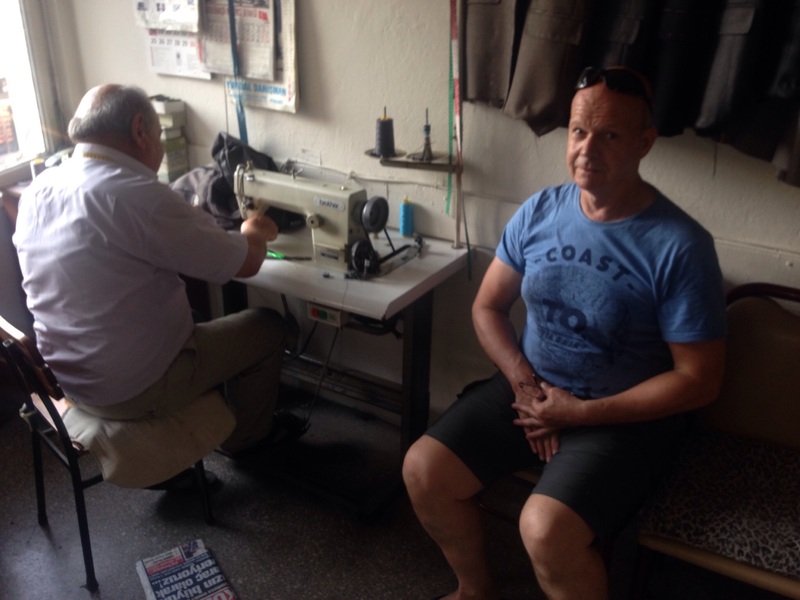 Once we arrived at Denizli, Steve needed to find a good Taylor as the fly zipper in his bike pants had been creating dramas over the past few days and finally let go today. So 25mins later after finding the local taylor and Steve had a new zipper fitted. The lovely old chap did not want payment so Steve bought him a selection of Baclava which he seemed to really appreciate. Steve required a new zipper in his bike pants. Job done! Not as bad as it looks, we were stopped at a random check point and allowed to pass. 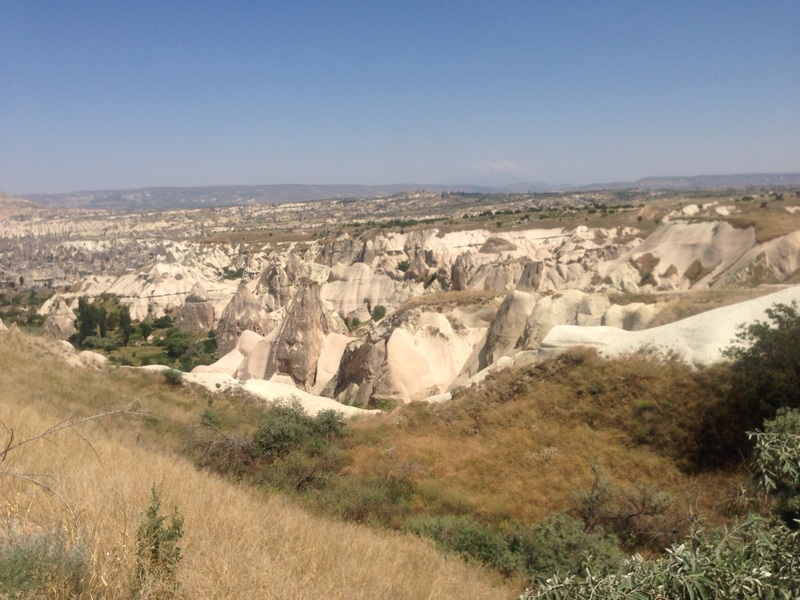 We rode from Tevfikiye (Troy Horse place) to Selcuk today which was a distance of approx. 365km in a southern direction (see Our Location). Temperatures rose to 38degC today and as I type this post at 7:00pm they are still well above 30degC! Steve and I are privileged to under take this adventure, with every kilometre we travel we gradually see the landscape and cultures changing which I am sure as we progress will be come more dramatic. So watch this space. Today we became aware of the landscape becoming dryer, hotter and life is simpler than that of the big cities and developed countries of Europe. The west coast of Turkey is covered with olive trees, I am sure every olive in the world comes from here! 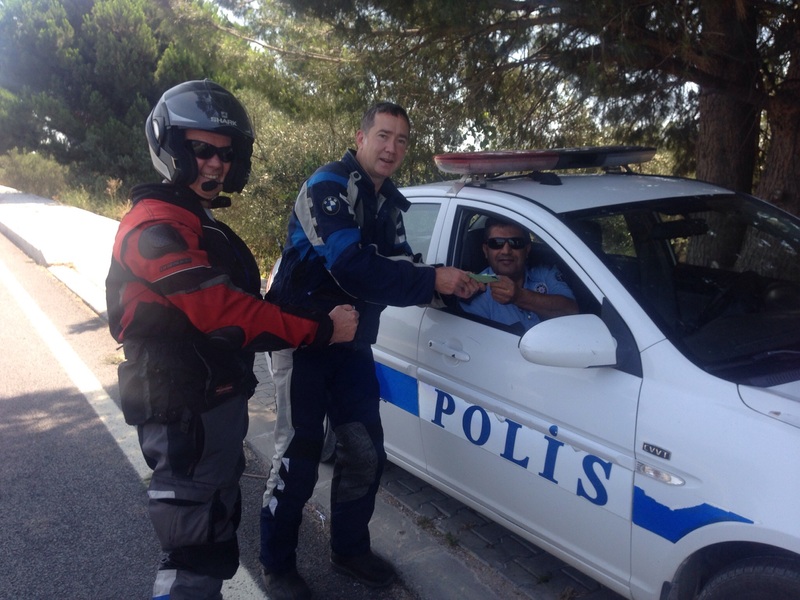 One thing that Turkish Police do is undertake random checks on motorists and today it was our turn. As you will see from the picture above the Police were very relaxed and happy to pose for a picture and wished us well on our travels. Let’s hope that attitude continues. 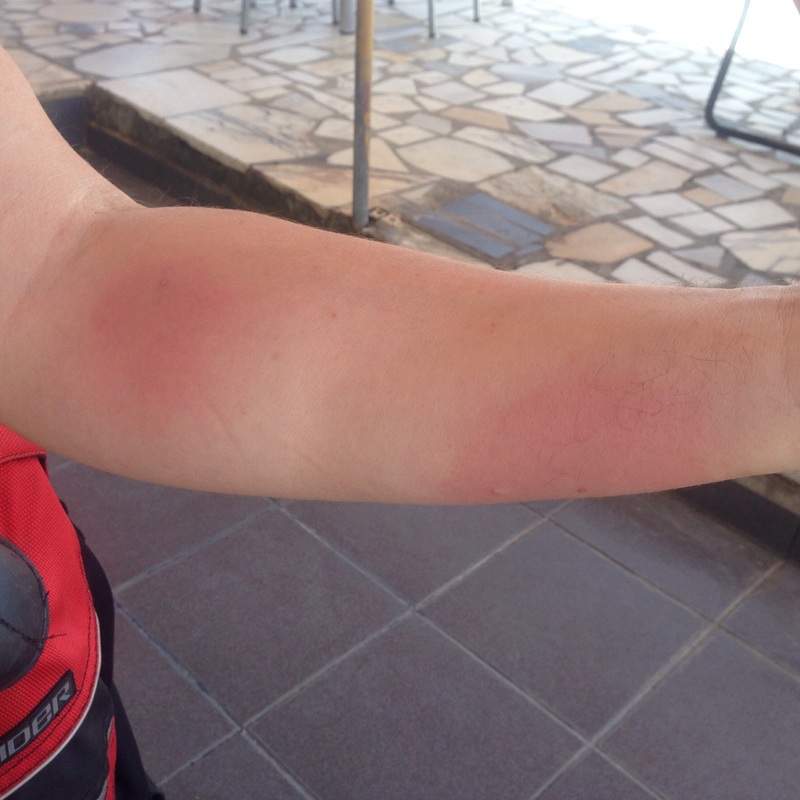 Unfortunatly Steve was bitten by a wasp like creature that flew up his jacket sleeve while he was riding yesterday and bit him several times on the arm before he was able to stop and remove the jacket. Today those bites had inflamed and were very tender which made life somewhat uncomfortable for him. Hopefully they will fade away soon. Steve was bitten by something while riding. Ouch! 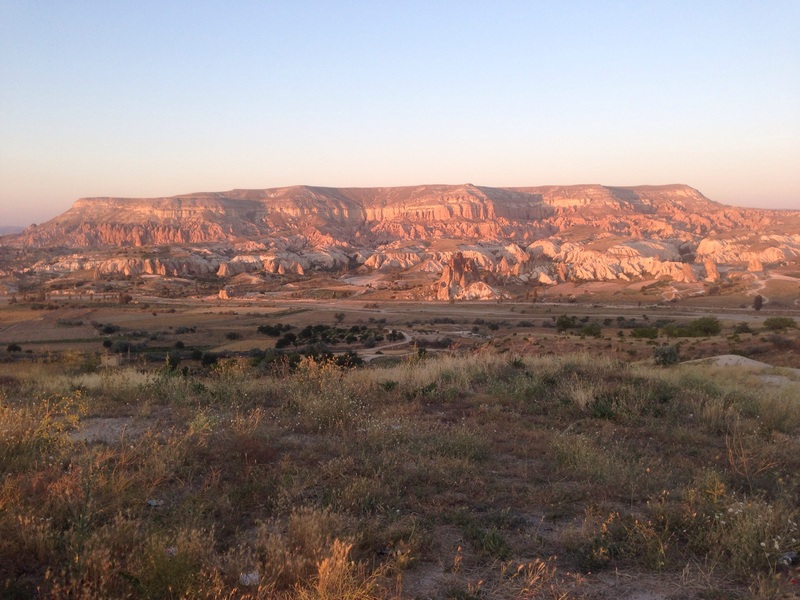 We have found Turkish people wonderful to engage with, offering assistance when we appear lost and genuinely interested in our adventure when we speak with them. 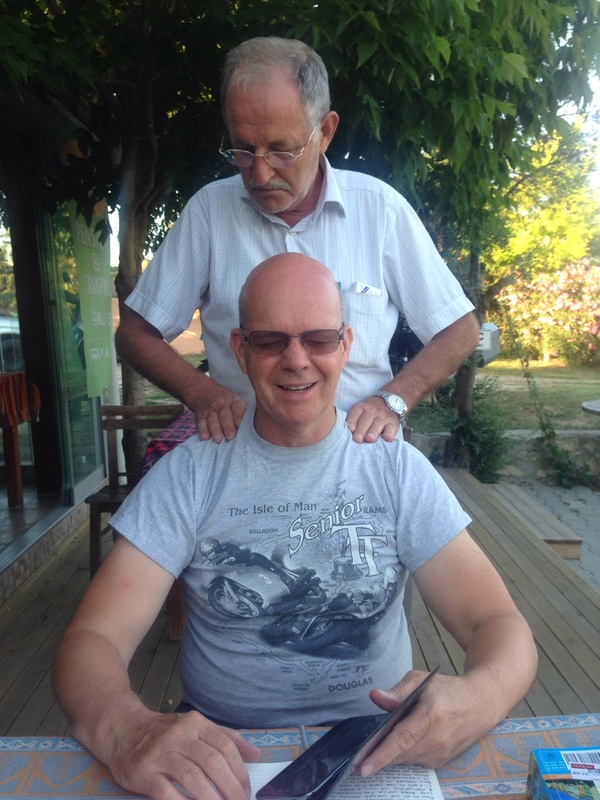 Last night while at the camp site a friend of the owner, without being asked walked over and gave both Steve and I a massage which went down a treat. A lovely chap at the campsite kindy walked up and gave us a massage! 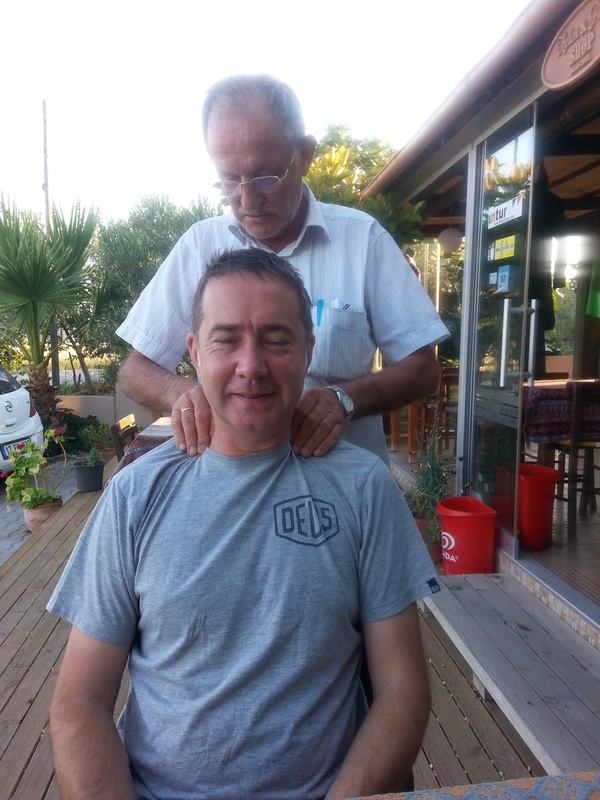 Steve receiving a massage by the kind Turkish Gent. Tonight we are staying at a cheap hotel in Selcuk and tomorrow we visit the ancient ruins of Ephesus which we are looking forward to, but for now we relax and soak up the atmosphere. 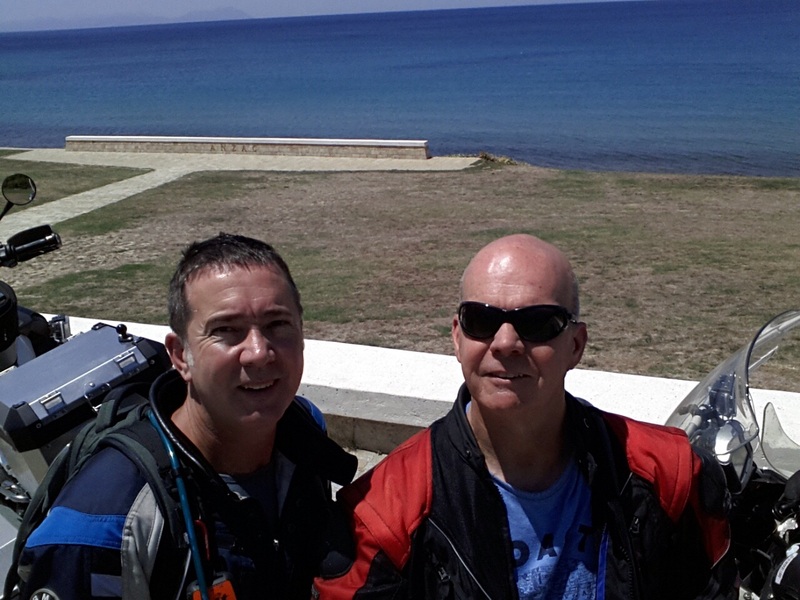 David & Steve at the ANZAC Memorial site on the coast. Moving! Today marks the 4th week on the road for Steve and I and so far we are keeping on track with our expected plans. It is safe to say that the first month has also been the “easy” section, travelling through mainland Europe where most things are not too different from home. It it is fitting that we spend this time in Turkey, the country where the East meets the West. The journey today took us from Gallipoli town down to ANZAC Cove to take in the history of the ANZAC’s. 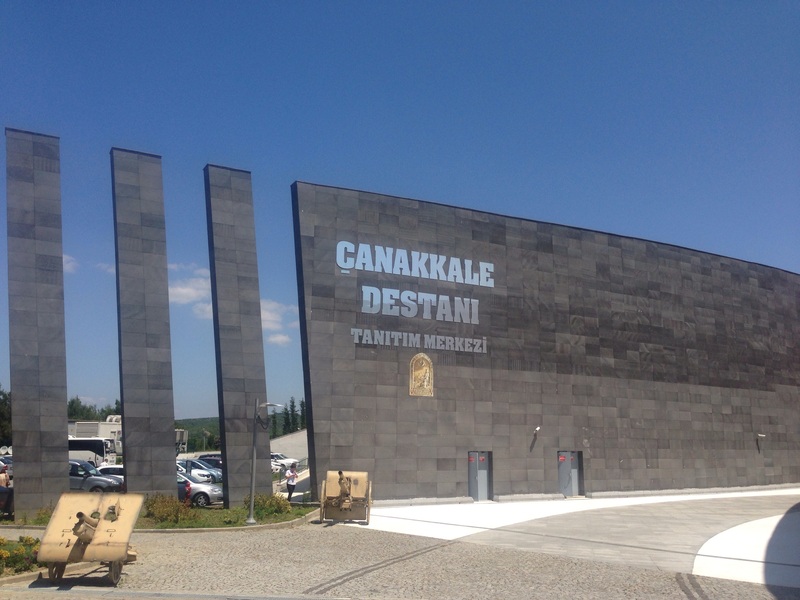 Upon visiting the Turkish Museum and taking the time to view the hour long educational movie reliving the famous war, but this time from Turkish eye’s certainly has been interesting. Either way you look at it, it is a demonstration of how futile war really is! The Gallipoli War Museum just outside Gallipoli. Highly recommended. 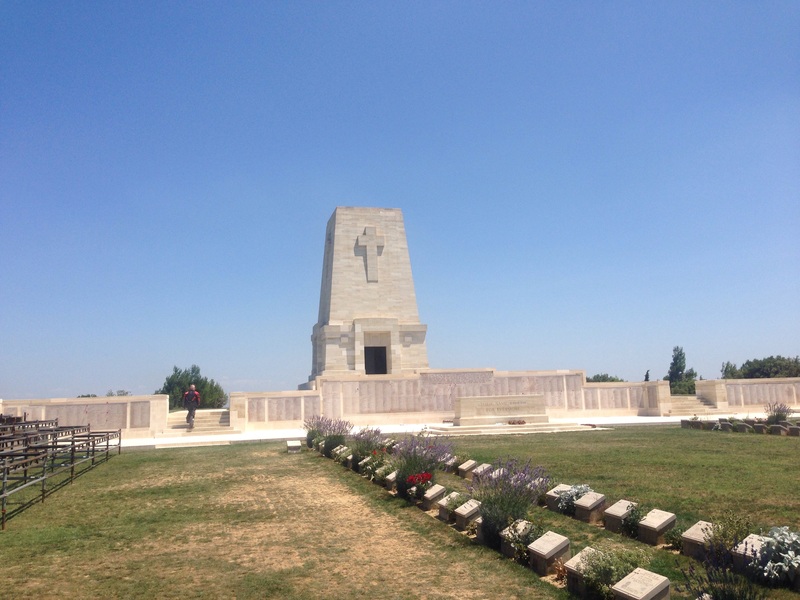 The ANZAC Lone Pine Memorial. We moved on from Gallipoli and headed for the ferry at Eceabat to Canakkale, which basically was a 25 minute drive on ferry ride that took us across the mouth of the Dardanelles in order to head South to Izmir. We have stopped at a camp site at Troy for the night. I have even managed to wash my bike (part of the 1 month celebrations) and you will notice from the picture below that we no longer are carrying the black bags behind the rider. This is thanks to our wives taking the additional items back with them to Sydney and has made life soo much easier for us chaps due to the reduced weight and significant increase in space. The bikes without the extra bags behind the seats. Makes a whole lot of difference. ANZAC CoveANZAC Lone Pine Memorial. One last thing to buy at the camping store before we left. Today was the day we said goodbye to the girls who flew back to Sydney at lunchtime. 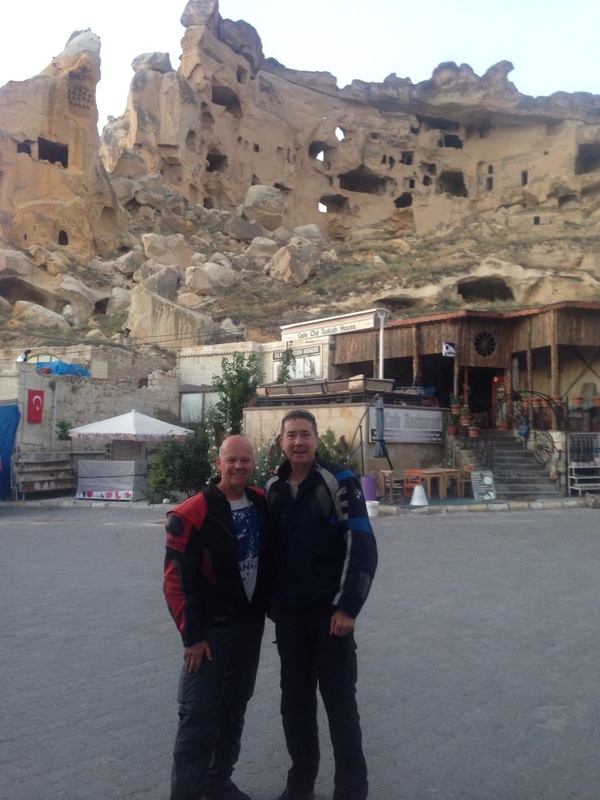 It was also time for Steve and I to push on into the East, but not before we made our way to Gallipoli and ANZAC Cove. It was sad to see the girls depart as we waived goodbye from the kerb as they were ushered off in a yellow Istanbul taxi. It will be the last time we see them till we arrive back in Sydney. 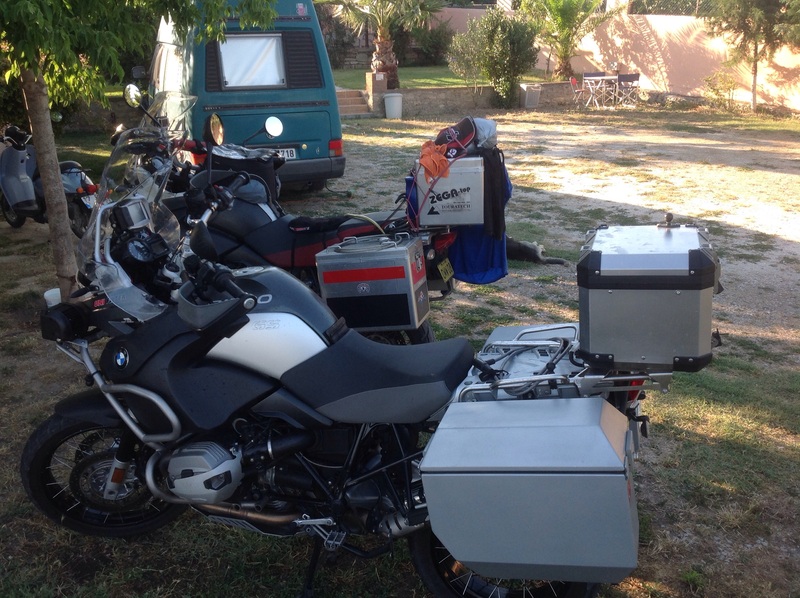 Steve and I had taken the opportunity to have any excess items we were carrying taken back home which meant we both managed to loose approximately 10kg of unwanted baggage including getting rid of the bag immediately behind the rider on each bike. WOW, did it make a difference to the way the bikes rode. Such an improvement! We had to stop off at a camping store prior to leaving town. Steve was after a pair of quick dry shorts and we also wanted dehydrated food. Once underway the rest of the day went without any hiccups as the navigation out of Istanbul went smoothly and our ride to our destination of Gallipoli was an easy stretch at just under 300km’s. We did stop off for a nanna nap however on the way. We we have stopped in the town of Gallipoli for the night and we were both underwhelmed at the town as it’s pretty poor and scrappy! Tomorrow we are off to explore ANZAC Cove, but for tonight it’s a relaxing dinner down at the beach front and an early night. 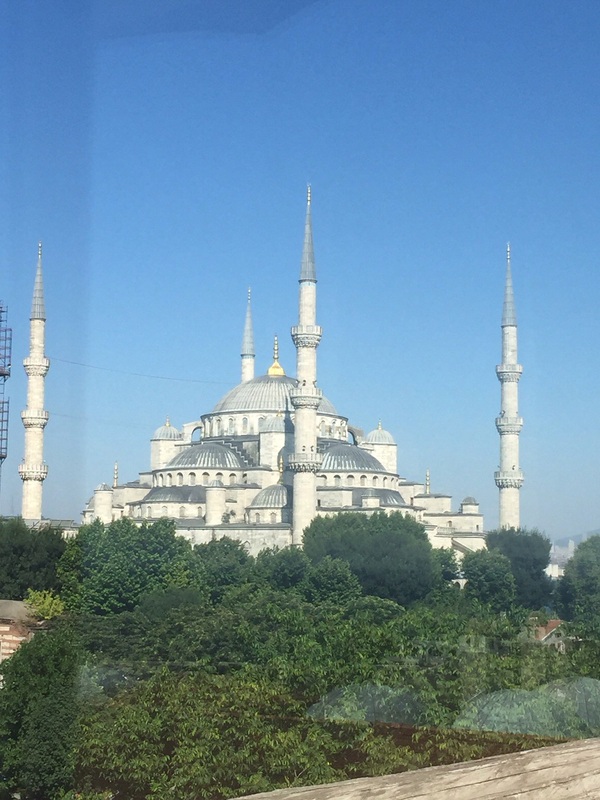 The Blue Mosque is a huge impressive building dominating the sky line of the Old City. Today was our last day together in Istanbul as tomorrow we say farewell to the girls as they fly home and we push on. I finally found a cafe with good internet connection and the girls found a Turkish Bath to pamper them selves and Steve went and had a hair cut. He later returned with stories of how the barber had used a cigarette lighter (turned up high) to burn the hairs from his ears! Oh and he kept asking us “can you smell the burning “? The afternoon was a lovely slow walk through the Blue Mosque which is a truly fantastic design with a tiled ceiling and walls. We are advised there are over 20,000 hand made ceramic tiles and 200 stained glass windows. We all were asked to observe the custom of removing our shoes and ensuring the girls had their hair and shoulders covered. The evening was finished off with a great time at one of the local restaurants we had become friendly with. 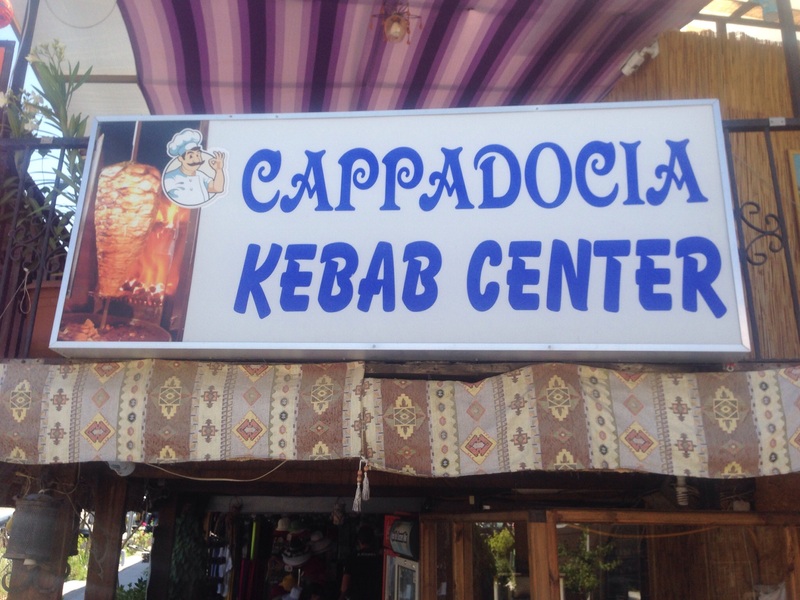 The Turks really do have a sharp wit and great sense of humour. We finally staggered home at around mid night. 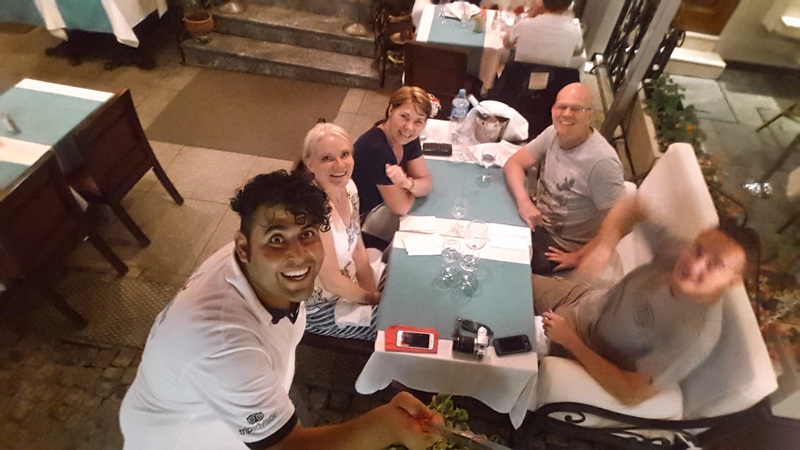 A great way to finish off our Istanbul experience together.